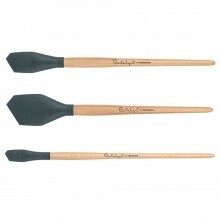 These flexible silicone tools are designed for use with heavy-bodied paints, oils, acrylics, and water-mixable oils. Because they are heat-resistant, they excel with encaustics. The silicone is easy to wipe clean and is solvent resistant. Clean up in most cases can be done with mild soap and water. Dried paint can be peeled off the silicone surface.